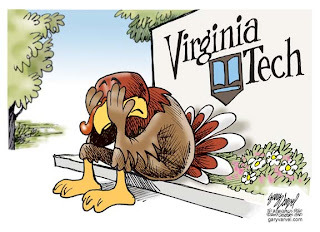 Virginia Tech athletic events. We invite everyone from all over the country to be a part of the Virginia Tech family this Friday, to wear orange and maroon to support the families of those who were lost, and to support the school and community we all love so much. We are trying to get a "Web Orange And Maroon Effect" going for Friday. We've challenged bloggers and other webmasters to incorporate Hokie colors into their site for the day. Learn more and check sites that are participating. Even though I am a die-hard WVU Mountaineer til the end, I have enough orange to mimic the sun of California (given we haven't seen the sun in days) and also have a bit of Maroon, so I'm definitely going to show my support. and after you're done wearing your orange and maroon (or while wearing it if you like), do pick up the bong and raise it high to those that would have partaken.